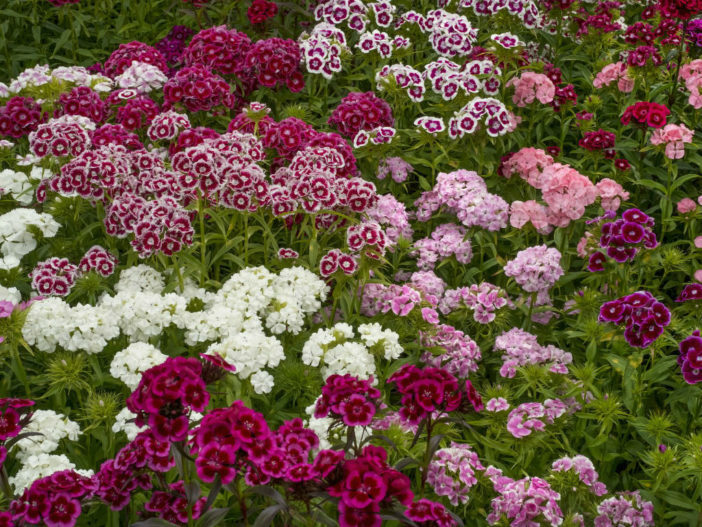 While you may be loathe to remove the sweet blossoms of Carnations (Dianthus caryophyllus) or the cheery, profuse blossoms of Sweet William (Dianthus barbatus), once the flowers turn brown, they’ve got to go if you want more blossoms to follow. Whether you grow the flower in your garden beds or in containers, picking the spent flowers off, also called deadheading, allows the plant to put all its energy into producing more blossoms. You could simply cut the flowers off at the top of the stem, but then you would be left with unsightly bare stems. Cutting with an eye to emerging buds and flowers keeps the plant looking good while also encouraging more flowers. Sterilize your pruners with rubbing alcohol or alcohol wipes. This practice minimizes the risk of spreading plant diseases from one plant to another. Also ensure that your pruners are as sharp as they can be so you get a clean cut. Identify which stem holds the dead flower, and look down the stem from the top until you find either a branching stem with a fresh flower or bud at its end. These flowers below the main flower are also called lateral flowers. Lateral buds may appear as soft, rounded bumps at the end of the stem or they may appear as almost opened flowers. Cut the stem of the wilted flower with sharp, clean pruning shears, immediately above the highest stem with a bud or lateral flower that is below the dead flower. Repeat the process of finding stems with dead flowers and cutting immediately above stems with lateral flowers or buds on remaining branches throughout the growing season of the plant. When there are no more buds or branches left, cut the entire stem back to the base of the plant, leaving any leaves at that site intact. Sterilize your pruners again before storing them for their next use.